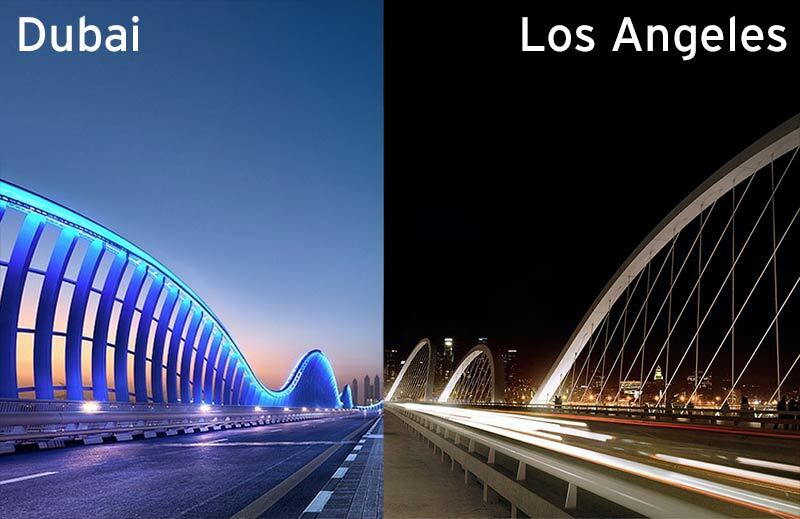 We could’t help noticing that LA’s new Sixth Street Viaduct, which is being designed by a team led by HNTB, bears a striking resemblance to Dubai’s Meydan Bridge, the royal VIP entrance to the Meydan racetrack where the prestigious Dubai World Cup is held annually. The bridge was featured in the recent film, Mission Impossible: Ghost Protocol, but sits empty for most of the year. Of course there are differences between the two: Meydan’s arches are made of steel, not concrete, it’s not cable-stayed, and its upper arches don’t touch the ground, but they’re still very close in all their wavy glory. The Meydan Bridge in Dubai.